Thanks for the opportunity China Mountain Trails, says Bhim Gurung fresh back from the Yading Skyrace in China. There he took on Italian Tadei Pivk, the 2015 World Skyrunning and beat him into second place. 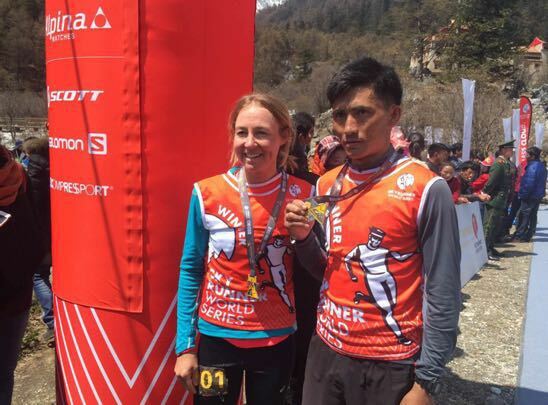 “I tried as hard as I could, but he (Gurung) was so fast on the downhill, I couldn’t keep up,” said Pivk. This is one of the natural talents of Nepali runners that makes them competitive. Being born and raised walking hillside trails develops a downhill ability that almost looks innate. Bhim had been spent 3 days training at 2900m altitude in Jomsom, Mustang for the event. It was to be longer, but his visa application meant that he had to return to Kathmandu to attend the visa office. Winners Bhim Gurung with Megan Kimmel. Bhim’s colleagues Bishnu Maya Budha and Dipendra Bam also performed well coming in at 5th and 8th respectively. 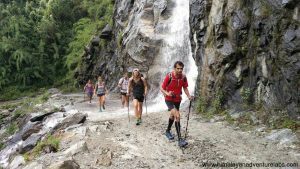 All three got the opportunity through an association between Trail Running Nepal and China Mountain Trails. The winners of the Kathmandu Ultra 50km and 80km events would be given the opportunity to race at one of the CMT events, an opportunity for which these three runners are fantastically grateful. Full results here. Race report from Skyrunning World Series is here. In America you smile for photos, in Nepal you don’t. 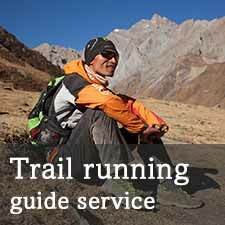 Bhim Gurung and iRunFar’s Bryon Powell. Here is a video of Bhim finishing under the blue skies of Yading. This entry was posted in Blog, News and tagged bhim gurung. Bookmark the permalink.